I couldn’t stop thinking about my polenta mistake! From my blog the other day: Creamy Polenta with Mushrooms. Even my friends wouldn’t eat it! I brought it into work with a few other dishes that I had made and the polenta just sat there… soupy… waiting for someone to try it but there were no takers. Don’t get me wrong- it looked good.. well at least I thought so, but it wasn’t! I couldn’t even swallow it the next day. If at first you don’t succeed- try try again! I can’t think right until I finish what I started.. well.. with cooking anyway! Is polenta even healthy? Was the polenta I had in the Italian restaurant last week or so even VEGAN? They said yes but do they know? I’m starting to think the word vegan in a non-vegan restaurant just means that there is no beef or pork in it. I have definitely met people who say they are vegetarian and eat chicken so… you know! Vegan is much more intense when dining out than just meat. It comes down to a frustrating conversation of: is there eggs in it?– egg whites?– butter?– milk?– cheese?– yogurt? sour cream? whey?– milk by products etc.? There is no way that polenta I had could have been vegan- I don’t think so anyway! From now on I will just say I’m lactose intolerant and allergic to all forms of milk! 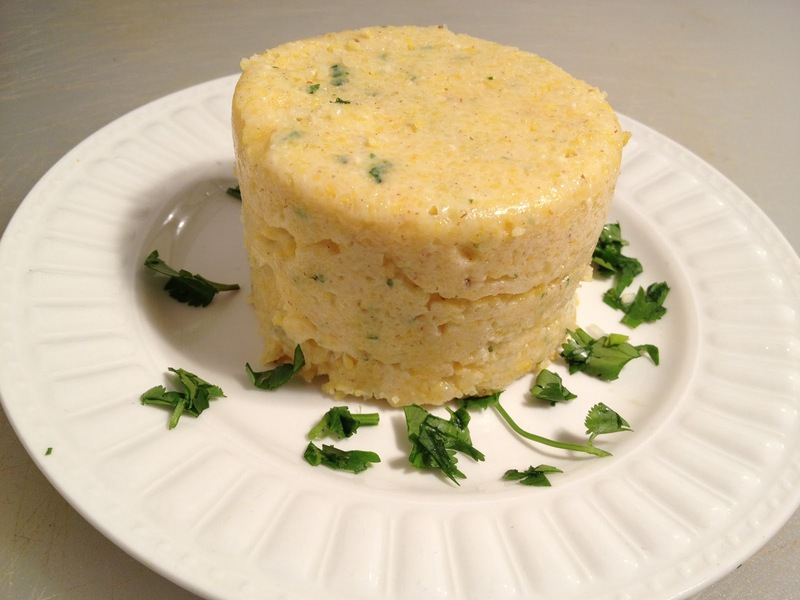 So here I am, making polenta as a corn grain- alkaline.. maybe and gluten-free so here it goes. I threw the polenta in last time with the room temperature water before boiling it- mistake #1 and then I didn’t cook it right or mix the liquids in right plus I guess I used too much liquid. This time I used 1 cup of polenta to 4 cups of liquid. The liquid consisted of 3 cups of water and 1 cup of soy milk. I brought the water to a boil FIRST and then SLOWLY added the polenta while briskly stirring or pretending to whisk without a real whisk. I think I used a cake mixer utensil. It thickened perfectly. I pulled it off the stove and I added some salt, parsley and cilantro. I added just a quarter of the milk as I did not want to make it too watery. I added a big tablespoon of earth balance buttery spread and then packed it into a slightly oiled cup. After letting it sit for about 20 minutes- my friend helped me take it out and turn it upside down on a plate- “plating” she said! Nice.. I loved it! I wouldn’t say it’s that healthy though- sorry!